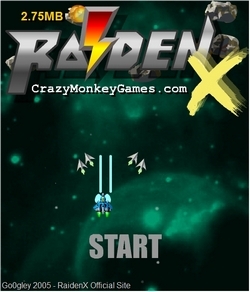 Description : Raiden X is one of the best flash games ever made. This game has it all: classic games, addictive gameplay, great power-ups, and big scary bosses! 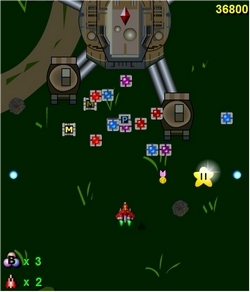 You play the role of a fighter plane who must destroy your enemies with an array of weaponry. Like most flash games, Raiden X keeps track of points. Raiden also has more depth with tons of weapons and bombs and different stages. The soundtrack is great too. On the title screen, select "New Game" whenever the background animation is flashing white. If you get the timing right, you'll start with 5 bombs instead of 3! For a better success rate, play at normal resolution (300x350) to reduce lagging. In stage 3, just before you reach the open harbour, you'll see a blue box marked with a "?". Don't shoot at it (if you have homing missiles or a wide-spread gun, let go of the FIRE key). Try not to die either, or the debris of your ship may hit the box. Wait until a nearby tank comes out of its base and runs over the box to break it. Taadaa! Out comes your free 1UP! During the takeoff sequence after stage 5, press CTRL. A textbox at the bottom-right corner will pop out. Type in "go0gleypower" and after the animation (stage 6), you'll remain invisible for 20-30 seconds. Survival guaranteed! You'll return to normal at around the time you see the ruby (which gives you a 1UP).